For the first time, a senior U.S. military official has commented on President Trump’s late-December decision to quit Syria, confirming publicly that American troops are planning to leave once ISIS is defeated on the ground. “We are determined to finish that off and then hand the battle off to our indigenous partners,” Army Chief of Staff Gen. Mark Milley said on Wednesday. His comments came hours after a suicide bomber killed four people in Manbij, Syria, including two U.S. troops, a Defense Department civilian, and one contractor. Three more were injured in the blast, for which ISIS declared responsibility. Milley did not say when U.S. troops would leave Syria, but his characterization suggests a change of one mission goal for the Americans, who until Trump's tweet last December were intending to remain in country until UN-brokered talks reached a peace deal in Geneva. The Trump administration had hoped to negotiate with Russia, Turkey, Iran, Syria’s Bashar al-Assad, and other NATO partners. The Army chief's comment also suggests that mission would not include National Security Advisor John Bolton’s pledge, made last autumn, to keep U.S. troops in Syria as long as Iranian-backed foot soldiers remain there. Until now, no four-star U.S. military leader has commented publicly on any aspect of Trump’s Syria plans, as administration officials have struggled to interpret and carry out the president’s oft-changing orders. On Dec. 19, Trump declared ISIS defeated; shortly thereafter, he called for an immediate and total withdrawal of U.S. forces from Syria within 30 days. Their presence, would be replaced by Turkish troops, he said. But in subsequent weeks, following criticism from Capitol Hill to allied capitals, Trump and other administration officials have softened their stance. 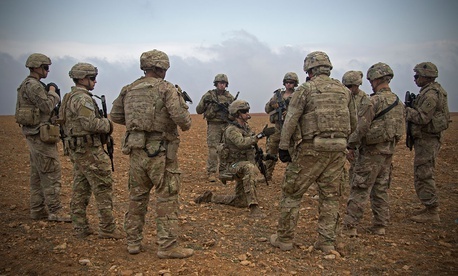 They now say the U.S. will not immediately withdraw all troops, as there was more fighting to be done, and because Turkey’s President Recep Tayyip Erdoğan rejected Trump’s demands that they protect Kurds, whom Turkey sees in part as terrorists and separatists. Currently, U.S. forces are fighting “a relatively small amount of remnants of ISIS — Daesh — as an organization, bottled up in a very small geographical area,” Milley told the Association of the U.S. Army audience just outside Washington, D.C.
Milley said the United States. is determined to hand the fight off to “indigenous partners” — by which he seemed to mean he U.S.-led Syrian Democratic Forces, and not Turkey. But a spokesman for the general later clarified that Milley had meant the 74-nation counter-ISIS coalition, which includes Turkey. The general’s imprecise language underscores the difficulty of interpreting — and publicly discussing — the wishes of Trump and his administration. Among the outstanding questions: how to determine when the ground fight against ISIS is done; how the U.S. military will hand off security responsibilities for one-third of Syria; and just who will pick those responsibilities up. Of late, the Trump administration’s Syria strategy has been marked by reversals and confusion, with the Pentagon, White House, and State Department seemingly unable to get on the same page. Milley said that appearance of confusion and lack of coordination between executive-branch agencies — and allies — was in fact normal. Wednesday’s bombing comes days after Secretary of State Mike Pompeo’s Middle East tour sought to convince allies the United States would remain engaged in the region, and prompted assurances from the White House that plan would hold true. At the Pentagon, Acting Defense Secretary Patrick Shanahan said, "Our fight against terrorism is ongoing and we will remain vigilant and committed to its destruction. Today is a stark reminder of the dangerous missions that men and women in uniform perform on our behalf each and every day." He spoke not at a press conference — Shanahan has not given one in his new capacity — but during a short ceremony to welcome Japanese Defense Minister Takeshi Iwaya to the Pentagon. When Shanahan was asked whether the bombing would affect Syria withdrawal, he replied, “What I'd normally say is we could take a few questions, but today our agenda is so packed that I wouldn't want to shortchange our guests, but I look forward to talking to you in the future. Thank you." Katie Bo Williams contributed to this report.